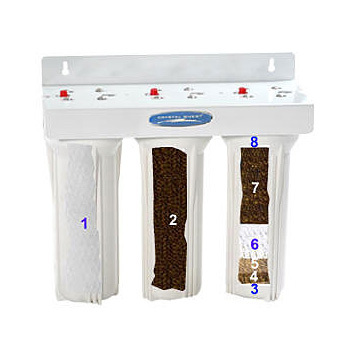 The Undersink Arsenic Filter Triple by CRYSTAL QUEST is a 3-cartridge, 8-stage filtration setup consisting of a Carbon Block cartridge, Arsenic removal cartridge and the standard 6-stage cartridge containing the Coconut Shell Carbon(GAC) and KDF resin layers. The Carbon Block cartridge is widely used in filtering organic solvents and mercury while simultaneously removing chlorine, bad taste and odor, and organic chemicals/contaminants from water. It also extends the filter life of the other cartridges as being the pre-filter. The Arsenic cartridge contains an Arsenic-selective resin designed specifically for reducing arsenic III and V. Under sink water filtration systems do not add clutter to your kitchen as it works behind visibility. 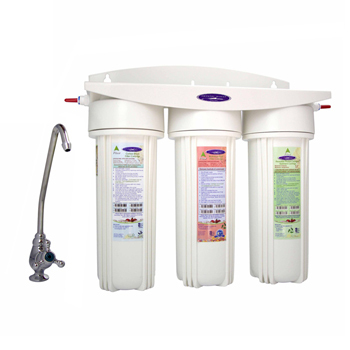 This compact, triple cartridge system is your best option to remove arsenic and other contaminants from your drinking water. One arsenic removal filter for better reduction. Easy install, comes with an attractive faucet and installation hardware. Resin used in the cartridge has a salt form, as clean, moist, tough, uniform, spherical beads. This highly porous anion resin is impregnated with iron oxide to allow for fast and efficient adsorption of arsenic. The added combination of Coconut Shell Carbon or Granulated Activated Carbon(GAC) and Eagle Redox Alloy media increases the systems' effectiveness in removing hundreds of other contaminants from your tap water. * Depends on the arsenic type & ppb of influent water. ** Max life of a carbon block is 12 months but we do not recommend using it beyond that due to potential growth of bacteria inside the cartridge. 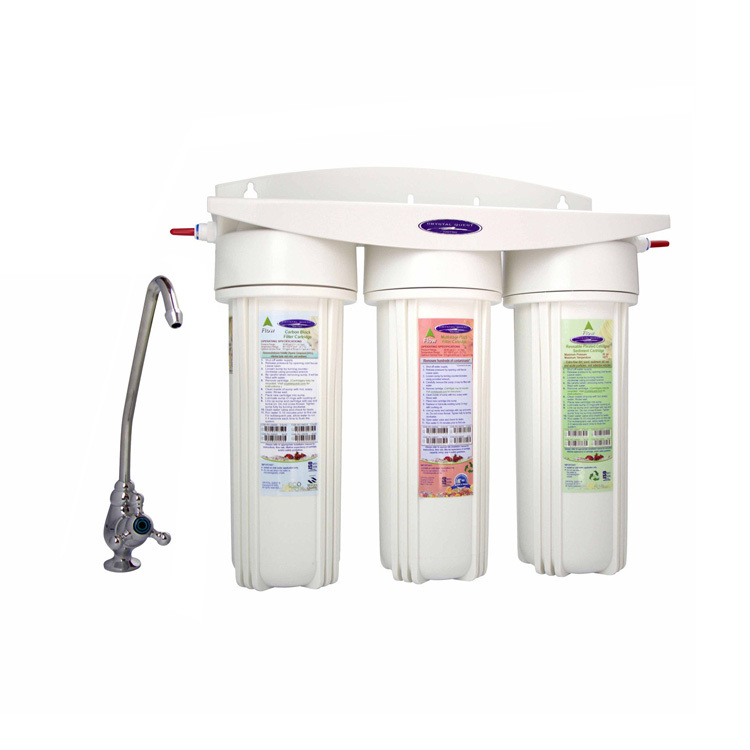 - Includes filter system, carbon block cartridge, arsenic reduction filter cartridge, 6 stage Eagle Redox filter cartridge, faucet, filter wrench, installation hardware.